Description: A bronze 20-Pounder Dahlgren Boat Howitzer, converted to breechloader, is mounted on a concrete base pointed SW. The base has bronze plate with WRC medal, draped flag, GAR medal and the inscription: "broken S R..Fulton Post No. 257 ~ Department of Kansas G.A.R. ~ James R Fulton W.R.C. No 240 ~ Department of Kansas". 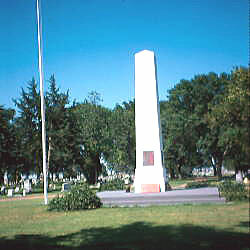 Description: A square concrete spire is mounted on a large flat pad. A bronze plate on the front is inscribed: "In Memory Of ~ Our Comrades ~ And ~ National Defenders ~ 1861-1865 ~ (GAR Badge) ~ Erected By ~ James R. Fulton Post ~ 257 G.A.R. ~ The Citizens Of Garden City ~ And Finney County, Kansas ~ 1945". A plaque on the side of the spire presents Lincoln's Gettysburg Address. Additional plaques at the base present the poem "The Bivouac of the Dead". 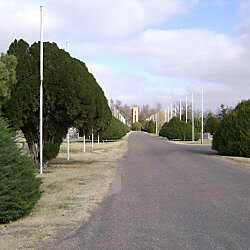 Description: A row of flagpoles lead to the main memorial in the cemetery. A granite monument identifies these as: "Avenue of ~ Flags ~ A Tribute ~ To All Veterans ~ Dedicated ~ November 11, 1973 ~ Marry H. Renick Post No. ( ~ American Legion~ John J. Haskell, Post No. 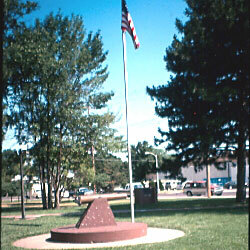 2279 ~ Veterans of Foreign Wars ~ Garden City, Kansas").